For the series #Evidence (2015 – 2017) – on display in rooms 3 and 4 – she visually dissected the way various American organisations present themselves via Instagram. In her latest work, Kruithof questions the aesthetical way the causes and consequences of climate change are depicted online. This series – on display in rooms 1 and 2 – was commissioned by Foam and created especially for this exhibition. 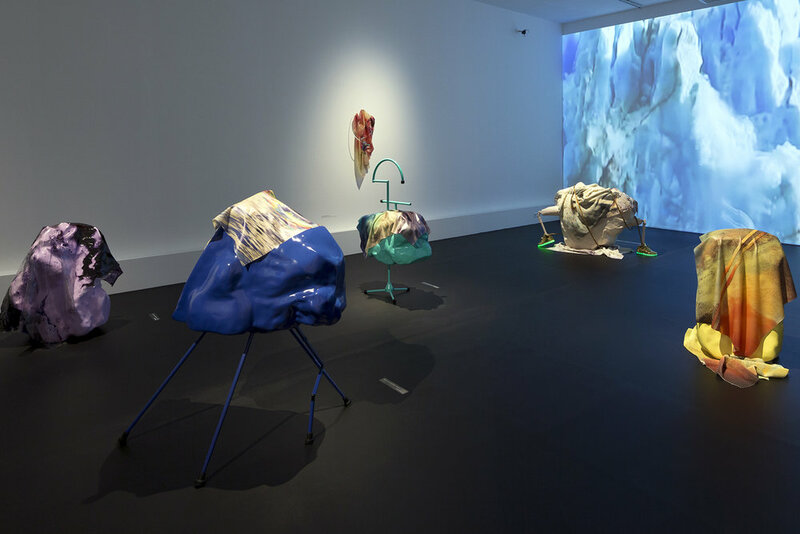 In addition to her recent work, the exhibition presents a complete overview of her publications, giving insight into the versatility and development of her professional practice. Kruithof’s hybrid works present a critical and playful approach to the (digitally) mediated way in which we perceive the world. Water functions as a both subject and metaphor for our contemporary visual culture: it is fast-flowing, fluid and malleable. The exhibition title refers both to the element of water – that largely makes up the world and the human body – and to a commonly used Mexican warning cry: ‘¡Aguas!’ also means ‘Watch out! Beware!’ The exhibition constitutes an alarming and seductive visualization of how the incessant flow and consumption of digital images gradually alienates us from our physical reality. Foam presents the first major solo museum exhibition: ¡Aguas! by Anouk Kruithof (1981, Dordrecht) as part of the exhibition series Next Level. The work of Kruithof is a refreshingly original contribution to contemporary photography. Approaching the medium from a great variety of angles, her works are equally versatile, ranging from photographs, sculptures and installations to videos, animations, publications and performances. A common denominator is her fascination for our complex relationship with the physical environment in the digital age. Reality as depicted on our screens consists largely of processed and constructed images that, in Kruithof’s view, have lost their integrity. At the same time we readily embrace the photographic medium as a means of promotion and self-validation. With her work Anouk Kruithof bridges the gap between the tangible world and the way it manifests itself online. The exhibition centres on Kruithof’s recent investigation into the online repre- sentation of urgent societal themes. Over the past few years she collected circulating images related to issues like privacy, government surveillance, pollution and climate change. Kruithof subjects these to critical scrutiny by extracting existing imagery from the digital sphere, and translating the photo- graphs into her own three-dimensional visual idiom. Kruithof feels both overwhelmed and liberated by the enormous number of images that are produced and consumed on a daily basis. In addition to her own photographs, she uses existing images as source material. For her most recent work she printed found or bought aerial photographs of environmental disasters (such as oil spills and chemical waste dumps) on latex, plastic and rubber anti- slip mats. She then draped these over sculptures that incorporate artificial appendages of the human body, such as prostheses, crutches or oxygen masks. These objects refer to the technological accomplishments of the human race, but also to the resulting artificiality, numbness and metaphorical lameness that result from it. With her apocalyptic installation, Kruithof emphasizes how a disastrous reality is aestheticized and often shared unthinkingly. A compilation of found Youtube videos of melting ice and collapsing glaciers confronts the viewer with an ongoing catastrophe. At the same time, excessive image consumption may eect oversaturation and eventual indierence; the original clips appear to have been posted mainly for the spectacle. The artist critically queries today’s culture of the spectacle and our digitally mediated relationship to the environment. In the work of Kruithof, the crashing ice comes to symbolise the imbalance between man and nature – and collective moral degradation. Found photographs of floating ice are draped over digitally modeled rock shapes, that are in turn projected over a sculpture.The still image is transformed into a moving, hypnotizing landscape that unfolds in the digital and physical realm simultaneously. The image morphs constantly and is as dynamic and flexible as the water. The work of Kruithof sits on the interface between the digital and the analog. The artist rarely confines herself to the flat rectangular format of the photograph. The installation Gloss Over consists of a layering of two and three-dimensional images. She also enlarged the confiscated identity cards of the weapon owners, printed them on PVC, vinyl and latex and draped them over security camera bracket arms and other metal structures. The abstract sculptures render the portrayed individual as anonymous and unhuman. The work raises questions about the integrity of online profiling and privacy violation in the name of surveillance and safety. Individual, institutional and corporate profiles can be freely shaped through an endless flow of online posts. The constructed image rarely corresponds with reality. For Carry On, Neutrals and Concealed Matter(s), Kruithof scrolled through the Instagram account of the American Transport Security Administration. She found numerous images of confiscated weapons that formed the basis for a colourful yet haunting photomontage. By extracting the ‘visual DNA’ of various American organizations from their digital context and manipulating them, Kruithof divests the image of its static (often promotional) significance. The artist describes the process as akin to dreaming: fragments from daily reality are associatively transformed to form fictional narratives. For her sizeable project #Evidence, Kruithof trawled through the Instagram profiles of 27 businesses, 15 government entities and 11 other organisations, including NASA and the Transport Security Administration. A total of 650 screenshots formed the basis for a series of photomontages and sculptures. Enclosed Content Chatting Away in the Colour Invisibility (2009-ongoing, wallpaper)Is a wall constructed of 3500 discarded books that slowly collapses. 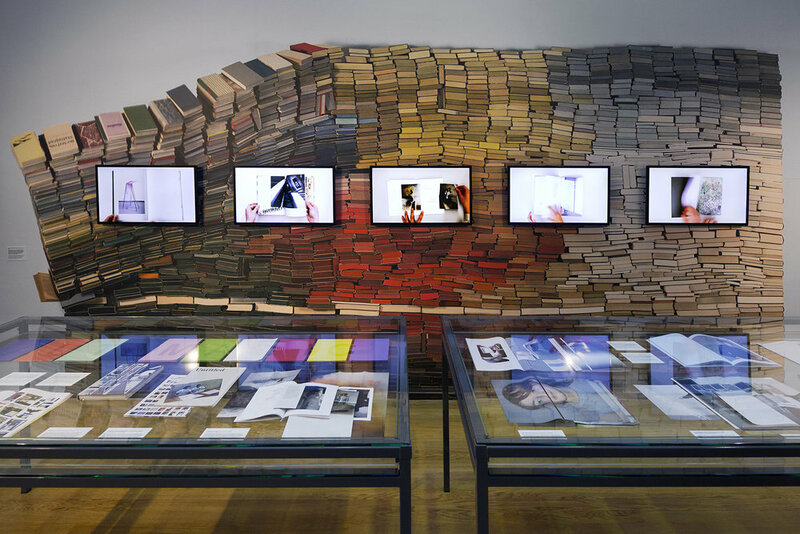 With her installation the artist questions the status of the book as a (at once disappearing and persistent) physical object in the digital age. By buying the books in bulk and rendering them into a sculpture, she emphasizes and undermines their (im)material value.